This dish was never part of my family’s Thanksgiving dinner, however it was in my husband’s family and just so happened to be one of his favorites. The first Thanksgiving he spent with my family I took it upon myself to make it, and it’s pretty easy. 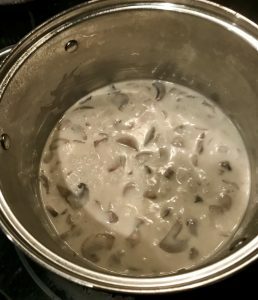 A can of green beans, a can of cream of mushroom soup, fried onion topping. My biggest issue with canned green bean casserole is texture!! So I’ve been making it from scratch for years now and it makes such a huge difference. Does it require more time, yes. So if this is not your favorite dish, and just something you signed up to bring dump those cans and be on your way! 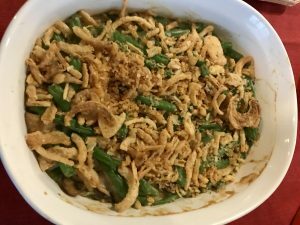 However if you are a green bean casserole lover like my husband, you can keep reading. Now when I say it requires more time we are not talking all day, 30 minutes and you’re good to go. 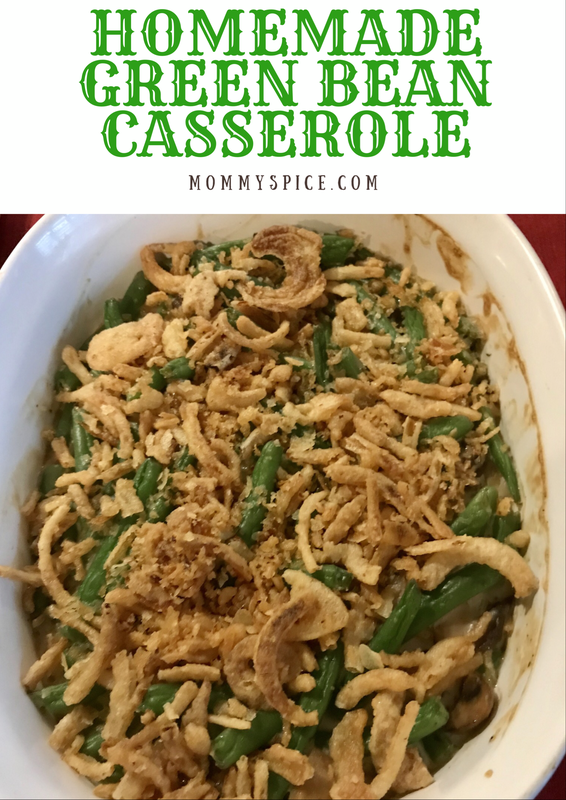 My favorite thing about green bean casserole is you can make it ahead of time. I prepared this tonight, for a Friends-giving we are attending tomorrow and it’s such a time saver. 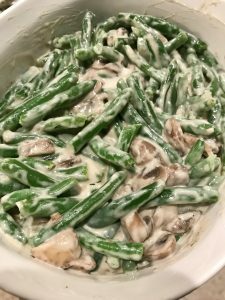 My biggest tip for homemade green bean casserole is to blanch your fresh green beans. For anyone not familiar with blanching, it’s a technique used when cooking vegetables. After you boil them, you then quickly submerge them into ice cold water, this stops the cooking process immediately, preserving the texture and it also keeps a really bright color to your veggies. After your green beans are done it’s time to make the soup, I’ve mentioned using a roux before in sauces and that’s the same process you do here. Sauté garlic, onions and fresh mushrooms in melted butter to which you add your flour, stock and cream. You let that reduce for 15 minutes and then you mix it with your green beans. I always make a little extra soup because my husband likes to have a cup, and the soup on it’s own is good. So if you happen to be a cream of mushroom fan and don’t mind a little extra work, you’re getting 2 recipes in 1 here. Once you’ve mixed your soup with your blanched green beans, this can stay in the fridge 24-48 hours. Before dinner time, top your green bean mixture with those awesome french fried onions and bake until warmed through. Depending on oven space on the big day you can go low and slow with this 350 degrees for 45min- hour or 425 degrees for 25-30 minutes. Just watch so your fried onions don’t burn. 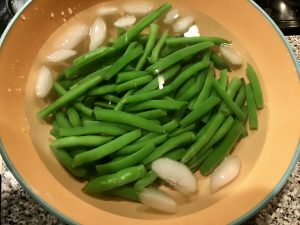 Boil the green beans in salted water for 6 min, then blanch into an ice bath, and lay them on a paper towel to dry. Next, melt your butter in a large sauce pan, add garlic, onion, mushrooms, s&p and cook 6-10 minutes, until onions are translucent. Add flour, whisk 1 minute, slowly stir in broth and cream, then let it simmer 15 minutes. When done, set soup aside, or have yourself a small cup while still hot. Now it’s time to mix the soup with green beans until coated, and place mixture into a baking dish. You can now refrigerate at this step up to 48 hours or bake immediately. When ready to serve, top green bean mixture with french fried onions and bake 350 degrees for 20 minutes if making immediately, longer if you make ahead. I mentioned above some different cooking options. Pretty much until warmed through and make sure not to burn your topping. My tip for this one, stir 1 of the 3 cups of your french fried onions into the green bean and soup mixture, this will add a nice little texture throughout the casserole. Also if you have any crunchy topping hogs (guilty as charged over here) then this way everyone gets those yummy fried onions in every bite.